Since Frankenfinger and a similar incident involving a large German shepherd and an even larger tree I have been trying out the Dogmatic head collar on Theo. This is the third head collar I’ve tried so I was a little apprehensive about how well it would work. 1. It comes in lots of sizes. As Theo is a cross he isn’t a standard shape for harnesses and head collars so this is a huge plus point. 2. It doesn’t ride up into Theo’s eyes. 3. It doesn’t snap his head round if he does decide to lunge at something. 4. If he does try to lunge ( I’m thinking of a recent walk where we met a brave or perhaps stupid pheasant ) then it actually closes his mouth so he can’t snap. 5. It comes in a variety of designs and colours. Yes I know that’s girly but if you have a dog that either looks mean or is considered as ‘dangerous’ then having something that doesn’t make it look like Hannibal Lecter is a plus point in my view. 6. It is fixed unless Theo lunges. 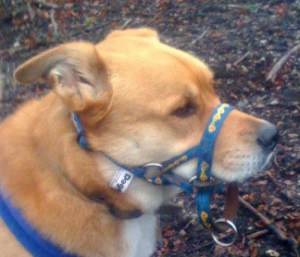 Some head collars tighten around the dogs muzzle as it pulls. This doesn’t seem right to me as if the dog if already stressed or aroused then having something tighten around his nose must be extremely uncomfortable and increase that stress but that’s just my opinion. 1. The design means that the ring where the lead attached is underneath the dogs chin on a loop of material/leather. This is fine while walking normally, however if you have a sniffer like Theo you need to keep an eye on what your dog is doing. Apart from scooping up leaves, mud, twigs and various other detritus he has managed to put his foot through the loop twice. Although there was comedic value both times he could have injured himself so it’s just something to note. Overall it has made walking Theo much easier. Although I tend to only use the chin hook when I need to, for example around livestock or if we see a dog coming our way that Theo doesn’t like the look of it has given me more confidence. After a couple of rather hairy walks resulting in accidents I was beginning to get nervous taking him out. The Dogmatic has allowed me to control the ginger menace without either of us getting hurt.